I mentioned last night that I would be making Spanakopita today and I did just that. I got the recipe off the Food Network website. 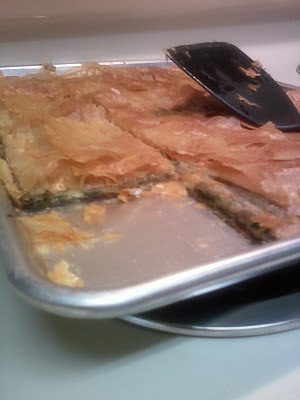 - When the spinach filling is cool, add feta and eggs and mix evenly. - Butter the layer then add more sheets. Continue this process a couple more times. This was the result of my endeavor. It smelt so good while it was baking. The next time I make this, I will do a few things differently. My spinach mixture (the filling) would be much thicker than what I had prepared. I wouldn't have baked it as long as I did. 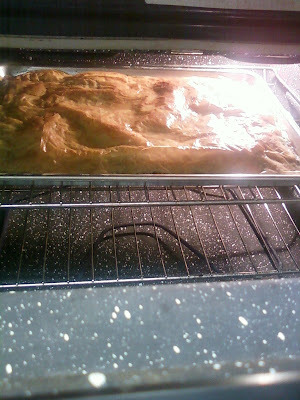 I wouldn't have used a smaller pan, maybe a 9x13 instead of the half-sheet pan that I used. So have at it people. Making this dish is really simple especially if you make the filling ahead of time. I think this dish is an appetizer. I'm not sure. It was delicious though. I paired it with chicken meatballs in a tomato and zucchini ragout. Bon Appetit! ooo thanks for sharing...that looks easy enough. i found that i don't mind spinach so much anymore so im def gonna try this! I love that stuff! and you made it look so easy! A greek resturant in utah (brick house) made it round like egg rolls and sometimes in triangles, but this way seems so much easier!